Whenever new projects arrive on the scene, whether they consist of seasoned veterans in some super-group capacity or of green newcomers, it behooves them to not waste time in getting their sound out to the masses. 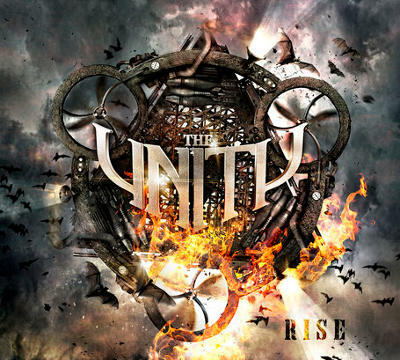 Newly born German power metal act The Unity, auspiciously named for a destructive force wielded by the arch-villain in DC’s cinematic response to The Avengers, seems to have heeded this longstanding truism as they waited for barely over a year after their eponymous debut put them on the map as a formidable representative of the more AOR-oriented side of their adopted style to unleashed a follow up LP. Rise continues the older school 80s heavy metal vibe wrapped in a modern package that was the staple of this band’s de facto previous incarnation Love.Might.Kill. that has been a recurring staple of Magnus Karlsson’s various projects, nay, the lion’s share of the Frontiers Records catalog of late, featuring the guitar chops of Gamma Ray’s own Henjo Richter, arguably one of the few technicians out there who could cut heads with the aforementioned Swedish shred powerhouse and come away unscathed, not to mention having a far more varied songwriting repertoire in his background. Despite having all of the right elements in place for yet another undisputed collection of new classics to match their previous album, the band opts to play it a tad safe this time around and finds themselves all but aping the Karlsson formula, often coming off as a Steamhammer backed alternative to projects like Free Fall and Allen – Lande. Naturally this tendency was heavily present before the band not only sticks to the same concise, fit for radio formula as the aforementioned bands, but also features a vocalist in Jan Maneti that couldn’t be any more of a dead-ringer for Russell Allen if he was singing for a Symphony X tribute band. Nothing really comes off as overly contrived to the point of drudgery, and some of the songs that manifest even manage to surpass a lot of the work on the previous outing, but overall the listener will likely find himself checking the band’s name frequently if he or she has any extensive experience with Frontiers Records’ alumni, minus the highly distinctive guitar tone and shred happy soloing of Henjo when it chimes in. That’s really the chief selling point of this album, other than a fair degree of vocal gymnastics out of Maneti, the virtuoso displays that hit the speakers at some point past the mid point of a given song. At first glance, this album gives this appearance of being an outright banger with the looming build up of the short prelude “Revenge”, chased immediately by one of the most blistering speed metal displays in “Last Betrayal” that this band has mustered to date. Likewise, the punchy riff monster with a driving feel that chimes in at the album’s midway point “No Hero” bashes one’s ear drums with about the same intensity that Masterplan’s chunky groove anthem “Crawling From Hell” did back in 2003 when this subset of power metal first rose to prominence, and a catchier chorus to boot. However, things kind of get bogged down in cliche territory at times, with the exceptions including a few notable cases of musical self-paraphrasing out of Richter that are lacking in subtlety. Between “Welcome Home” sounding all but a slightly modified version of Gamma Ray’s early era anthem “Heaven Can Wait”, “The Willow Tree” functioning as a stripped down modernization of “Lake Of Tears” from the latter days of said band, and the extremely catchy and admittedly fun “Children Of The Light” bearing an uncanny resemblance to “Follow Me”, this album’s originality score takes a few hits. This is by no means a bad album, nor does it fall into the category of a polished turd that sometimes afflicts releases with this degree of high fidelity production, but rather a middle of the road offering that will probably neither lose nor gain this band any fans. In a sense, it’s a missed opportunity because of how solid its predecessor was, yet there is still a fair degree of auditory treats between the fancy lead guitar showmanship and the reasonably catchy anthems that reaffirm the reason why the Masterplan school of power metal held such a commanding presence in the European scene through the second half of the previous decade. It might be a tad bit presumptive to assume that the somewhat generic character of some of these songs, lending themselves to the category of filler at times, is the result of the band rushing out a follow up to quickly, but hopefully next time around there will be a few more surprises aside from musical quotations of Henjo Richter’s extensive musical past. One thing is for certain, The Unity is definitely the real deal, as their version of phoning things in still comes off fairly strong. This entry was posted in Power Metal, Reviews and tagged gamma ray, germany, Henjo Richter, love.might.kill, Metalium, Michael Ehre, mob rules, power metal, Rise, Sascha Onnen, The Unity.